The air smells slightly of pollen and the bees are going crazy, so you know that spring has arrived. Our cool nights are probably not totally over, and daytime temperatures occasionally call for a jacket. 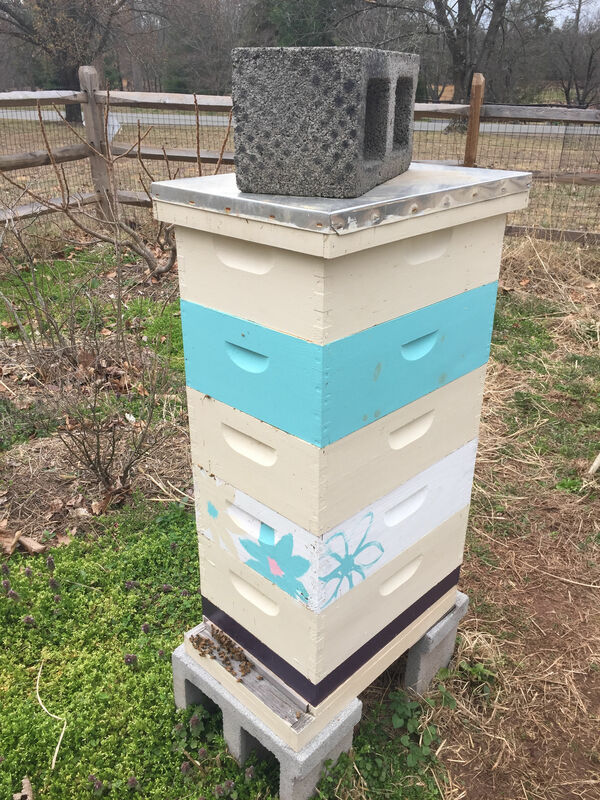 The hives are expanding quickly so it is time for a spring update. Overall our hives are doing quite well, save for the one hive (Jupiter) that dwindled and died last month. Our four remaining hives are shown in the picture of our apiary. On March 25 I went through Saturn, Venus, and Mars frame by frame as my first full inspection of the year. I ran out of time to look through Ganymede, so I checked her this past Sunday, April 2. If you weren’t aware, our hives are named after planets and moons. We started with Mars, Jupiter, and Venus. Last year I split Jupiter to produce Ganymede (one of Jupiter’s moons) and then when Jupiter swarmed anyways I created Saturn. My remaining all-medium Langstroth hive seems healthy. 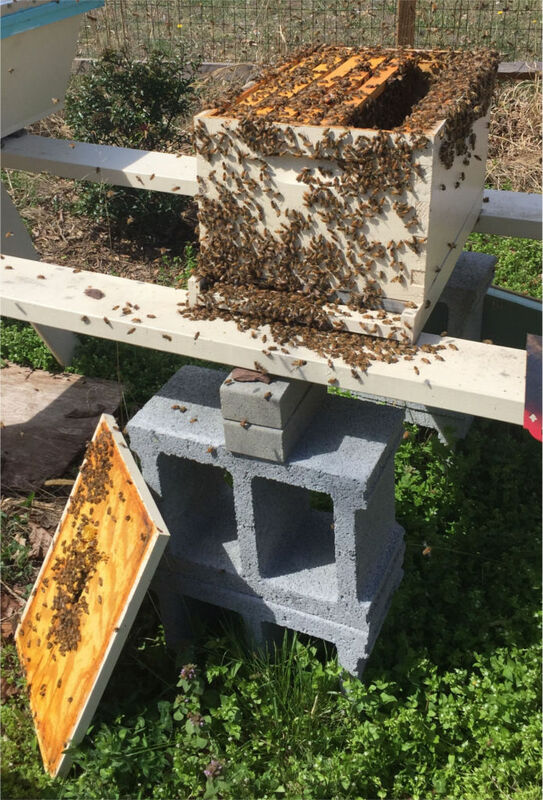 On March 25 the first box was pretty empty, the brood was across the second and third boxes, and the fourth box was fairly full of honey. This top box held the remaining stores from Jupiter, and the bees were filling it in the missing spots with nectar. On that day I did my first reversal (ever! ), meaning I swapped the two brood boxes to the bottom and placed the bottom box on top (so now third). The fourth box of honey I left alone and added a fifth box of foundation frames to the top. The result is the five-box stack shown in the picture here. This past Sunday I did a quick check of a few frames. The bees are filling the now third box with nectar, and I found the queen on a brood frame. Nice and plump, walking stately along the comb. No sign of swarm preparations. My top bar hive Saturn is doing great. I almost worry the combs are too big and heavy, though they seem to hold together so far. You can see the pretty brood comb in the picture, with drone and other brood and even an empty queen cup. On March 25 I found about 7 bars of brood, and inserted an empty bar into the brood nest to keep the bees busy. This past Sunday the empty bar was nearly built out, so I added another. I am a little concerned about early swarms, though we keep having cold nights every so often, which I hope has kept the swarm impulses at bay. The Russian bees from which my queens originally derive are known for building queen cups regularly, so I wasn’t too concerned about the empty one shown on the frame. My other top bar hive Venus is much like Saturn. Bars of brood and nectar and the colony expanding. I inserted an empty bar on March 25 and found it built out this past Sunday. I added another empty bar to keep the girls busy. This hive has an observation window in the side, and is nice for peeking in on their status. The colony seems to be expanding by a bar or two a week based on their progress in the window. Last, though not least, my problem hive Ganymede. She appears to do quite well; her bees are just a bit too aggressive for my taste. Although, it was Mars that gave me a sting (on the leg, no less) March 25, and the worst Ganymede did this past Sunday was follow me around the yard pinging my veil. I have always been a little afraid of Ganymede, so I resolved to split her up into nucs this year and perhaps even replace the queen. I check her last to keep the agressive bees from following me around while checking other hives, although that sometimes means she isn’t checked. So this past Sunday I checked her first. As expected, packed full of bees. In an 8-frame box, there are 9 seams between the frames. All of them, 18 seams across two boxes, were full with bees. I found larva, drones, and roughly 11 frames with brood, including drone cells. The picture shows the bottom box during my inspection, overflowing with bees. I’m sorry I didn’t get into Ganymede on March 25, as I also found a few frames with queen cells containing larva. This means the hive is thinking of swarming. In retrospect, perhaps I should have just split the hive into two single deep hives. Instead I made a nuc, removing four frames and attempting to destroy the few other queen cells in the main hive. I replaced the four frames I removed with deep foundation frames, and added a medium super on top. There is a good chance I missed a queen cell somewhere in the hive, so we’ll have to see if Ganymede swarms this week. If not then I hope there is enough empty space to keep the hive busy for a few weeks. As I mentioned, I moved some queen cells and frames from Ganymede into a nuc, as shown here. I moved a frame of honey, a frame of pollen, and two frames of brood, plus an empty foundation frame. I even shook some extra bees into the hive. It is a small box with little insulation, and that night was down to 45 F (7 C). 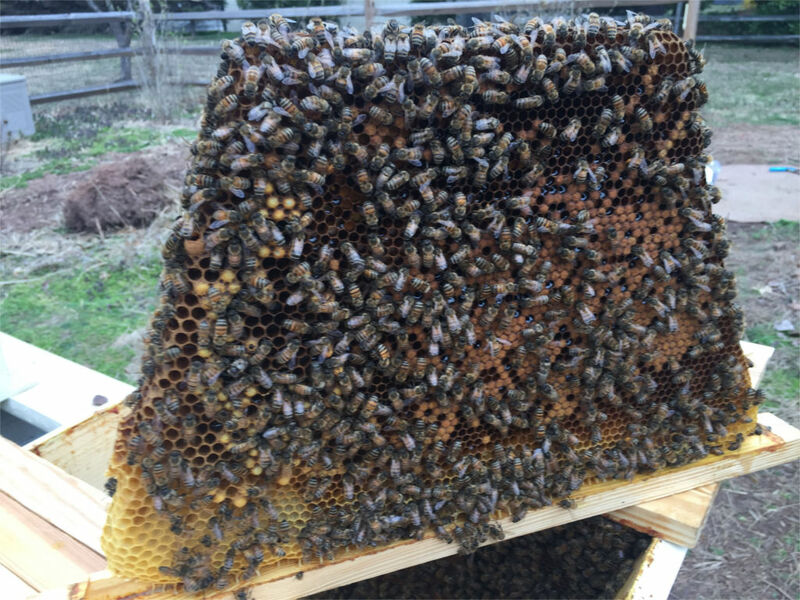 So I am worried there were not enough bees to keep the hive warm, and the queen cells were at the base of a frame which could easily be outside any cluster the hive forms. Today is Tuesday and I look at the nuc after work; no bees coming in or out. So I’m not sure my little nuc will make it. As I said, it might have been better to split Ganymede into two single box hives. In the heat of the moment with bees everywhere I did the best I could. We’ll see what the results are. I am still hoping to raise some queens from Saturn this year. 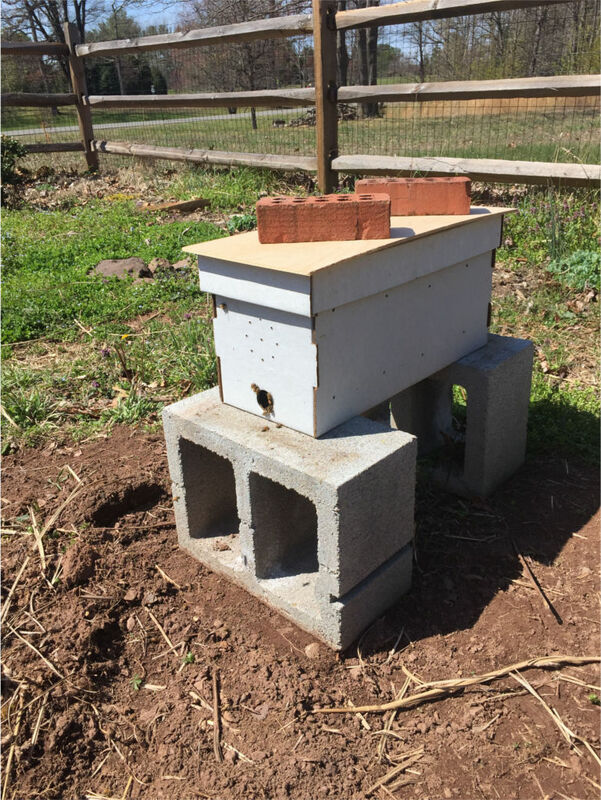 My plan was to start this coming weekend on April 9, moving a frame into a dedicated hive for raising queens later that week. I don’t think Ganymede will last long enough before swarming to form nucs, so I need to figure something out to keep her in check. Perhaps I will move the box to force the foragers into another box. We are due for overnight near-freezing weather in a couple days, so that should give me some time to come up with a plan. This song popped into my head as I thought about the hundreds of bees flying around the apiary this past week. During high school, I was active in our local community theater, and was part of the cast for a production of the musical Oliver!, where the song originates. The hopeful lyrics, sung by the ensemble of orphan boys, captures the desperate longing for something other than gruel, and the magical notion of having three meals a day. This is not to be confused with the parody song of the same name from the 2006 movie Ice Age: The Meltdown and sung by a flock of vultures. Same tune, though a different song entirely. What better phrase for a post in early spring, when the hives are filled with life; and food, glorious food, is plentiful. That is, food is plentiful for bees. If you would like to help find food for humans, I would recommend Oxfam International. You can read about them at www.oxfam.org. May you prosper and find honey. Another good one……sounds pretty complex….glad it’s you and not me….great photos too. Thanks Emma. We will see how they do. Thanks, Lauren. My daughter came up with it. I have learned a few moons as I may need some more names soon….